Snowman week and a sad good-bye. 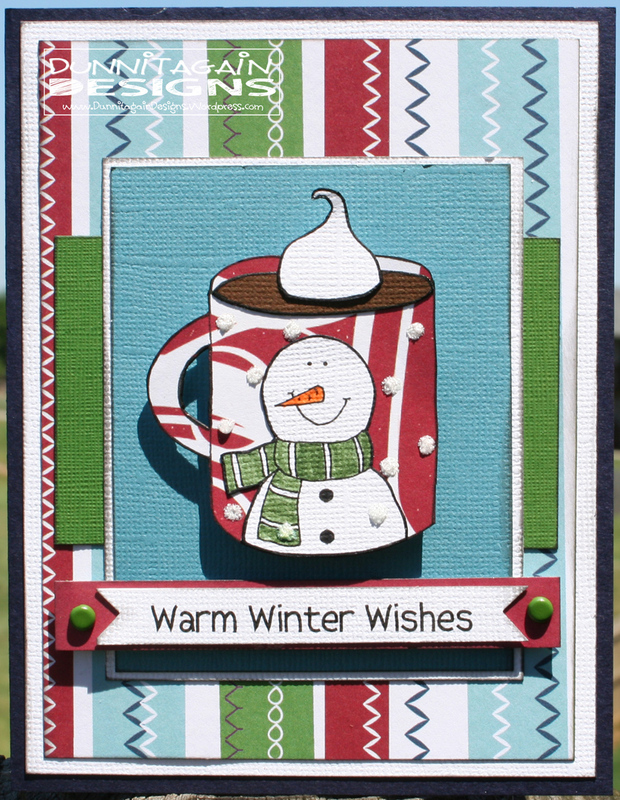 Today at For Fun Challenges we are making Christmas/Winter cards that have a snowman on them. We are sponsored by Dearie Dolls….check it out she has several free stamps at this time. Unfortunate this will be the last challenge at For Fun Challenges. She is shutting the doors after 3 years to take care of other obligations. I’m sad because this challenge has pushed me in my creativity but happy to see what God has in store. Whenever one door closes it gives God opportunity to open another door…. just wonder what it will be. I sure hope you will play with us this last time. 1) Card Patterns Sketch #167 – Use the sketch provided as inspiration. 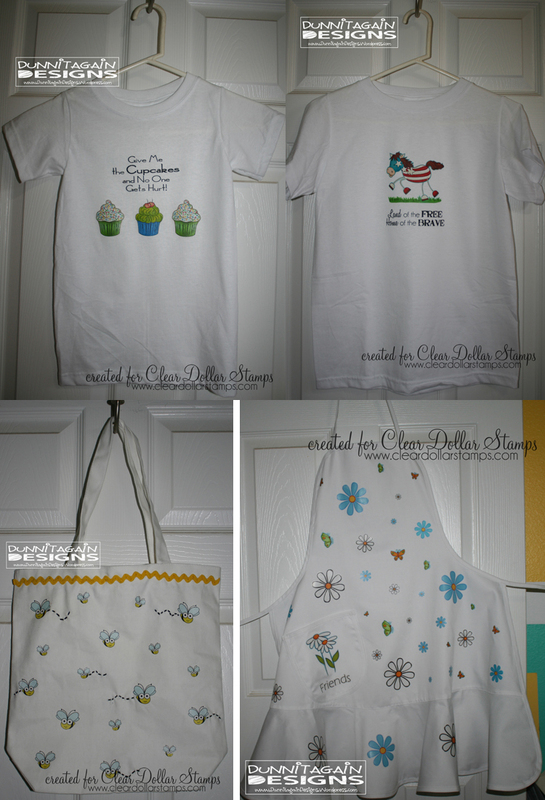 Digital Stamps and T-shirt transfers are a perfect pair! I have NEVER done a T-shirt Transfer before and now I’m kicking myself!! They are super duper easy!! If I can do it YOU can do it. 1) Alphabet Challenge Blog – H for Handmade Flowers. We would like to see your handmade flowers on your work please, and don’t forget it doesn’t just have to be cards, anything goes! God is so faithful and loves us so much. I feel so blessed to be able to rely on the creator of the universe. I hope you will join us this week. 1) Word Art Wednesday Challenge #29 – This week’s free scripture/word art is Psalm 62:8 which speaks of TRUST. As long as you use an encouraging or uplifting sentiment on your project, that is fine. Clear Dollar Stamps is sponsoring Tuesday Morning Sketches this week so I just had to play. I love their sketches and get to show off the Value Verses Digital Stamp from Clear Dollar Stamps all at the same time…doesn’t get much better than that. I’m in an all girl discipleship class at my church and we get a different person to pray for each week so I have decided to send the person I pray for that week an encouraging card. 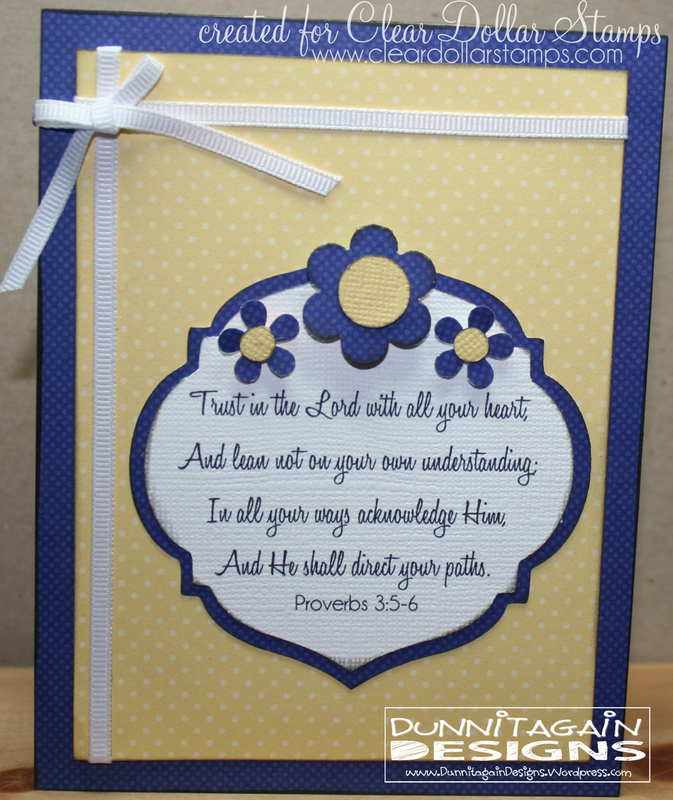 This week I’m praying for my friend Stephanie and this was the perfect verse for her card. I combined it with the sketch at Tuesday Morning Sketches and I have to say it turned out pretty darn cute. The color scheme was picked because blue and yellow are Stephanie’s favorite colors! 1) Tuesday Morning Sketches #147 – Use the sketch provided as inspiration. 2) Alphabet Challenge Blog – H for Handmade Flowers. We would like to see your handmade flowers on your work please, and don’t forget it doesn’t just have to be cards, anything goes! 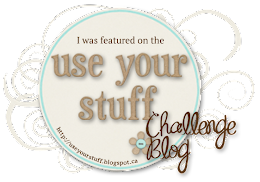 If you are just joining us head on over and start at the beginning on Lori’s Blog. 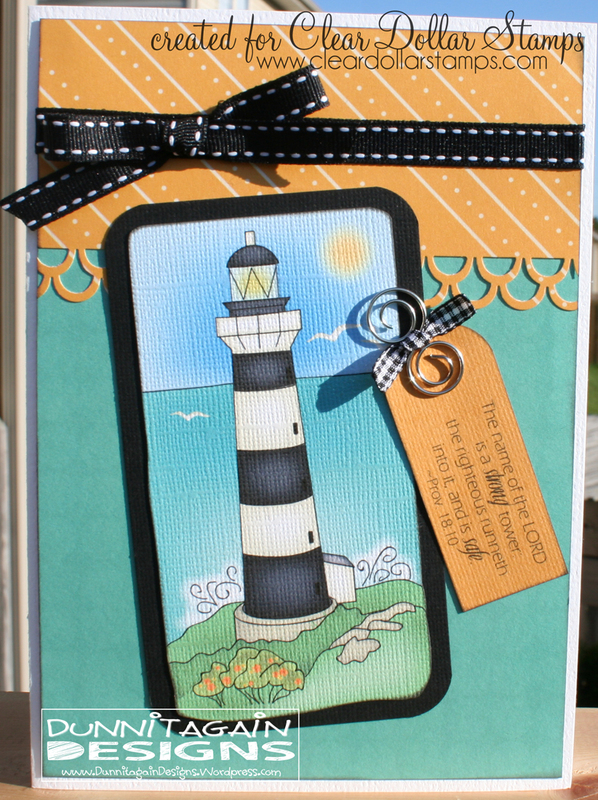 If you just came from Jerusha’s blog – I Love Paper Crafting you are in the right spot. For hopping along with us One lucky winner will receive a $25 Clear Dollar Stamps gift certificate for digital images! The Winner will be randomly chosen from comments received on a DT member’s blog. 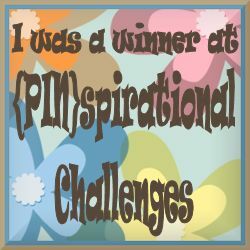 The winner will be announced on my Blog and the CDS blog Thursday, May 24, 2012. The design of the card was inspired by Card Positioning Systems sketch #265. I am so happy I tried this sketch as I totally love the end results. This is a long skinny card (9 1/4 x 4) that fits in a legal size envelope. Yep, flowers, flowers flowers is the challenge this week at For Fun Challenge. 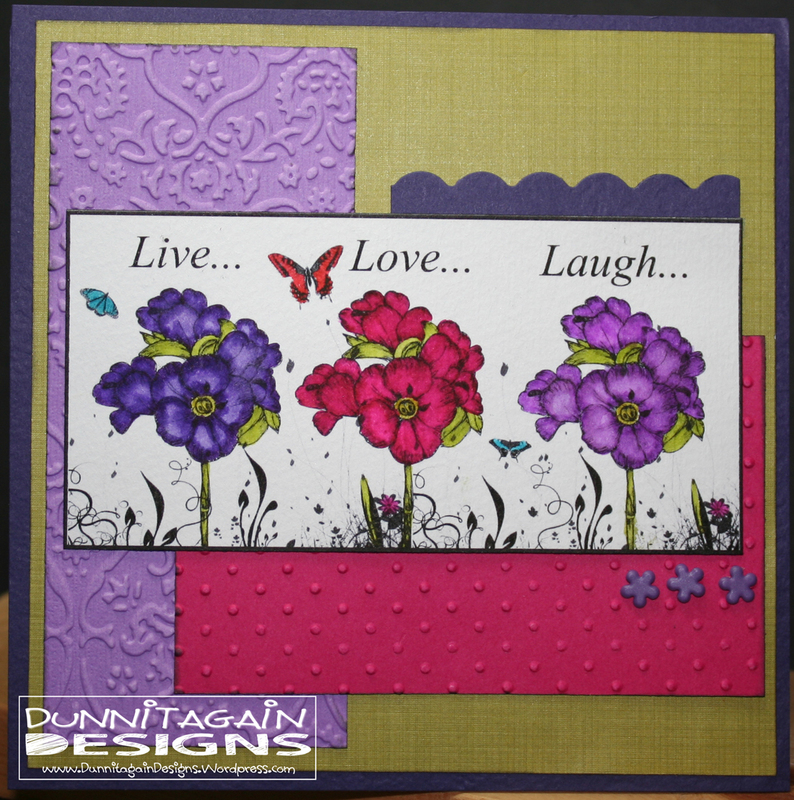 Our sponsor this week is Bugaboo and they have wonderful stamps that have several flowers in the stamp so it made this challenge super easy! We are short a couple team members at the moment due to health and life reason so I did two cards this week. 2) My Favorite Things Wednesday Stamp Club Sketch #71 – Simply follow the sketch and create a card or other paper creation. You may use any stamps and supplies that you wish. If the winning card uses MFT stamps, the participant will earn a $5 bonus, for a total of a $20 gift voucher! I used the sketch as my inspiration but changed it a little to work for me. 3) Catch the Bug Challenge – Things with wings! 4) Stamptacular Sunday Challenge #163-This week’s challenge is a…“Butterfly Kisses!”For this weeks challenge you will create a card or project that has at least one butterfly somewhere on it! We MUST be able to see the butterfly…it can not be hidden! Oh…and don’t forget to stamp! After all, we don’t call this STAMPtacular for nothing! My 2nd card is for my girlfriend who is having a heck of a time with her teenage daughter! I figured she needed a little laugh about the situation! 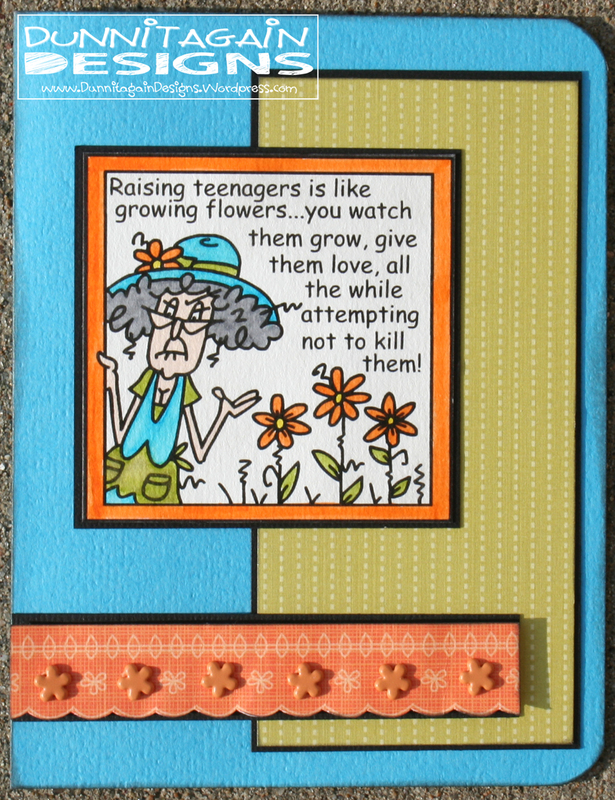 1) Card Makin Mamas Challenge #45 – May Flowers! 2) Crafty Creations Challenge #169 – Frame it! 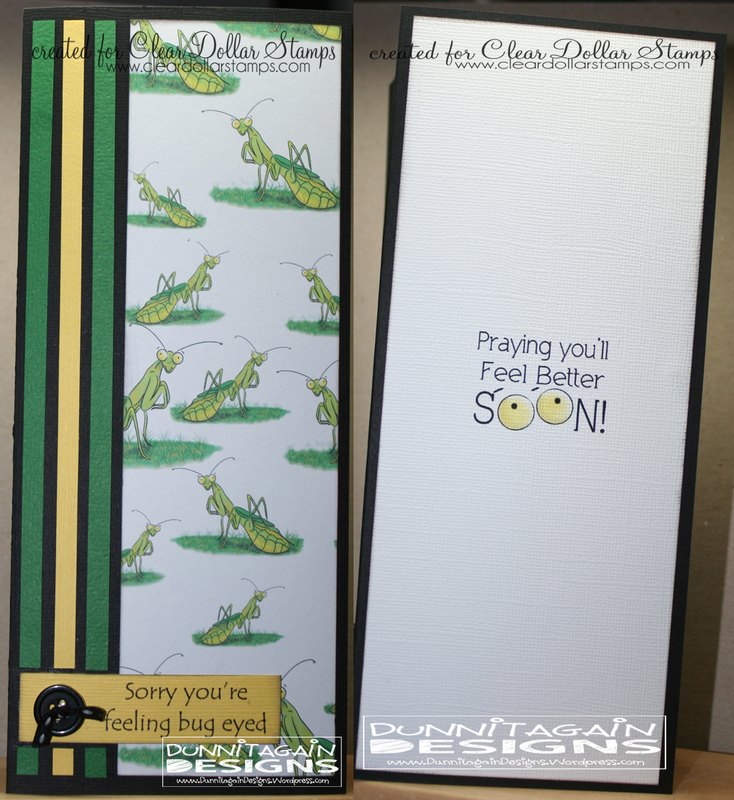 hat’s right, use a frame of some sort on your card, altered item, scrapbook page or whatever you create!! And you can be pretty creative too … you could use a image that has a frame, use any image and a hand-drawn frame around it, or you could use a few nestabilities or other dies to create a frame! The options are pretty extensive! !